To go with this rushed post, I give you the perfect food for when you are in a rush. You can make the chili ahead and freeze it, then make this dish anytime you are in a hurry or don’t feel like making an extravagant dinner. Oh and did I mention it is the most delicious meal ever? OK, good. In a large pot, combine all ingredients except the mac 'n' cheese and green onions. Bring to a boil, then reduce the heat and let simmer for 20-30 minutes. Meanwhile, cook the pasta according to the box directions. 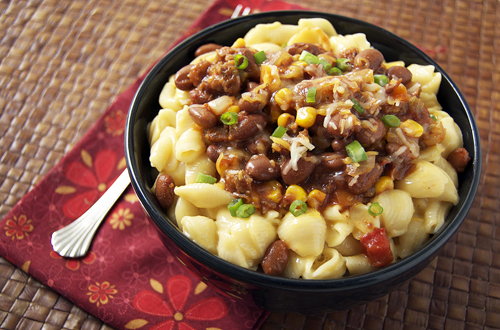 To serve, spoon mac 'n' cheese into bowls, add chili, and garnish with green onions. Sunrise and surfing sounds wonderful — enjoy every minute! And bravo for “living life to the fullest” — that’s what it’s all about. 🙂 Thanks for the recipe, too! My husband, while stationed in Hawaii 45 years ago, discovered Chili and Rice. It was ‘beach food’ and a bowl was 15 cents. We are still enjoying a bowl every now and then. What a fantastic winter comforting meal! Looks gorgeous! Sunrise and surfing in Hawaii sounds wonderful. Enjoy your time in Hawaii. Your dish sounds good. 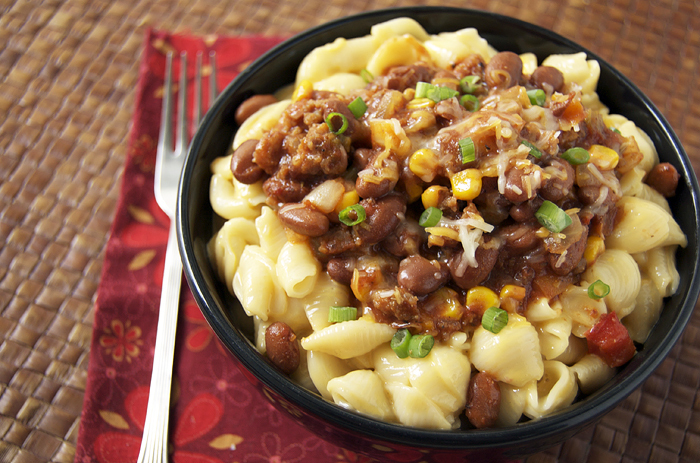 I actually never had chili mac n cheese, so I am utterly intrigued. And your time in Hawaii must be a whirlwind of awesome, but also very exhausting. Hang in there and enjoy it! whhhhhaaaaat?! mac n cheese and chili?! that’s amazing stuff right there. auh-may-zing! I am so jealous you are in Hawaii! Live it up. This looks delicious, a lot of restaurants in the DC area do this, I will def have to try making it sometime! Damn right I forgive you – this looks like the perfect dish for me right now. 😉 Enjoy every sunrise you can! Still jealous of your time in Hawaii – waking up to sunrises and surfing sounds like the life!